Ever wish you could stay at the Plaza Hotel just like Kevin in Home Alone 2? Well now you can make your home feel like you are staying in the luxuary suite! This gorgeous arrangement is filled with vibrant red Roses, stunning Stargazer Lilies, candy cane Carnations, fresh white Snap Dragons, and simple white wax flower. 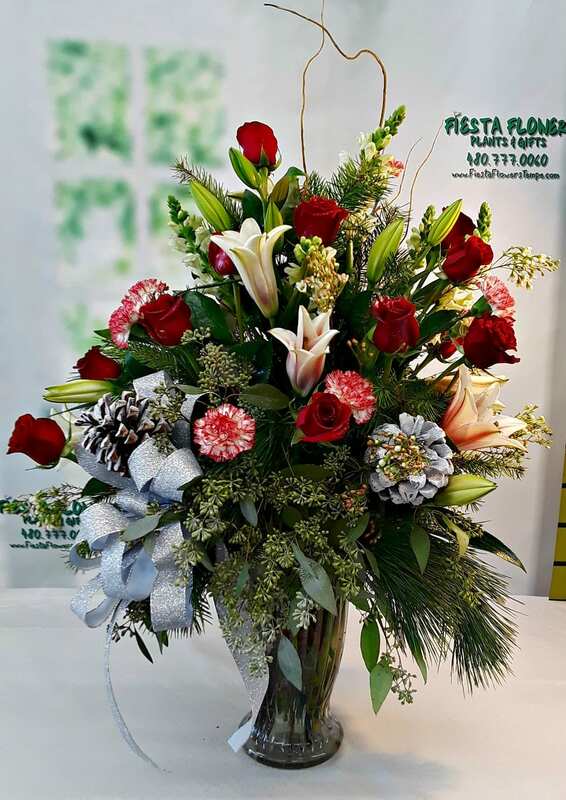 To give it the true Christmas at the Plaza feal we have added wonderful Christmas greens, seeded Eucalyptus, and curly Willow for the magical holday feel. “Snow’ covered pine cones also compliment this piece along with the big sparkly bow.